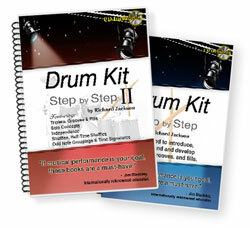 News: Richard Jackson has just released his second book in the "Drum Kit Step by Step Series." drumstyles.com's own Richard Jackson has just released his second book in the step by step series. With focus on triplets, limb independence, odd note groupings, and odd time signatures, there is a wealth of imformation for even the most seasoned of drummers. Welcome to DrumStyles.com! We have worked many hours to fill this site with useful drum beats and lessons in many styles. It is our goal is to cover every popular genre, as well as make some of the less mainstream genres available to the online drumming community. No matter what style(s) you want to play, the more styles you learn and research, the more your sense of groove will benefit. To help fine tune your styles, find a drum instructor near you. When you learn to play other musical styles authetically, your groove will improve in every style you play. You will begin to enjoy better control over the subtleties, giving you a more mature and artistic sound. It is important to be conscious of the concept that the way you play a drum pattern has more impact on the actual notes that you are playing. If you take the most stripped down and common groove of all American music, it could be applied to almost any style, including Rock, Metal, Disco, Funk, Gospel, Rap, Shuffle and so on. An exagerrated example of this concept would be to hear this beat applied to Rock, then to Shuffle (by swinging the 8th notes). As you browse through the different sections of this site, try playing each of the grooves in different context - hip-hop, rock, shuffle, jazz, etc. If you are able to control the subtle accents or articulations, the volume at which each limb is playing, and how straight or swung you play, you will be able to play all popular styles with autheticity, creativity, and confidence.